Sinéad began studying the violin at the age of two and a half with the Young European Strings School of Music. She now holds both a diploma and a licentiate in violin performance from the ABRSM (the Associated Board of the Royal Schools of Music) as well as an M. Phil in music technology from Trinity College Dublin. 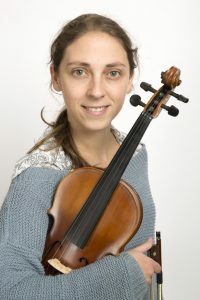 Since then, Sinéad has been violin tutor at the Kingston Academy of Music, Dalkey and teaches leaving certificate music at Ashfield College in Templeogue, as well as teaching with Music Generation Wicklow.